You can tell which country is doing well by the number of tourists that come from within its borders and travel around the world. For instance, during the 80’s when Japan was supposedly poised to overtake the U.S. in wealth and the yen was like gold, there were Japanese tourists everywhere with their Nikons and Minoltas. Then in the 90’s the world was inundated with the newly rich Germans and their camcorders. Of course, Americans have wandered the globe widely since the 50’s. The Brits and the French have also been globe-crawling mainstays. In Europe, I saw Spaniards everywhere, freed from fascist Franco rule and flush with cash, benefiting the most from the Eurozone. And even more recently, Russians seem to be cropping up all over the place. But that’s nothing compared to the tidal wave of Chinese tourists who are arriving on every shore around the world. Around Asia the Chinese are everywhere. 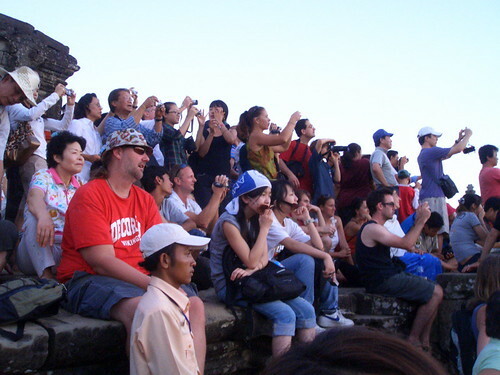 And in Cambodia they probably constituted the largest group of tourists. A close second were the Koreans and then the Japanese. The East Asians tended to arrive on sites by the busloads, harried and rushing about. I suppose the tourist industries in these countries concentrate on providing group tours, an efficient way for tourists to cover a lot of ground with minimum hassles within a short length of time. Unlike the Europeans, who have the longest paid vacations in the world, the East Asians have to make do with just a few days. Quite honestly, the bus tours were obnoxious. The guides were loud, the jet-lagged masses were sometimes pushy, and they attracted a cacophony of peddlers. T and I set out early in the morning before the rush. We cherished the eerie silence of the ruins. But once the crowds came, we migrated away from the tour groups and explored marginal corners of the temples or went to rarely visited temples. Invariably, former imperialists love to return to their stomping grounds. In Indonesia there were many Dutch. In Cambodia, it’s the French. They traveled around in gangs by minivan and generally wandered around like they owned the place, whether it’s by taking over the hotel pool with their brood of children or swamping your quiet corner of the temple with their chatter and cigarettes, pretending like you’re not there. Seriously, each French family seemed to have a minimum of five children. I actually like French people very very much. But to be able to travel all the way from France to Cambodia, with a family of seven, you have to be pretty rich. Very rich actually. Of course, by Cambodian standards, all of you reading this are rich (including myself). But I’m talking about rich by Western standards. And rich people are pretty much the same all over the world, acting like they own the place, and treating everyone as if they were invisible. We even witnessed a very rich Cambodian family wander around Angkor Wat acting like they owned it, half of them talking loudly on their mobiles, casually tossing aside trash, and flicking cigarette butts onto the ancient stones. There were smatterings of other Europeans. But they were mostly German and British. There were more Australians than Americans. And I found that the Australians and British were way more drunk, loud and obnoxious than the Americans. I wonder if the reputation of loud Americans really came from Aussies and Brits mistaken for Yanks. Most of my non-American friends can’t tell the difference. Talking with the locals, I got the impression that they thought all white people who spoke English were Americans. And any white people who couldn’t speak English were considered French. No wonder Canadians put their flag on their backpacks. Who’d want to be grouped with the mishmash that is mistakenly identified as American? Maybe I should have just kept my mouth shut when people mistook me for Japanese.